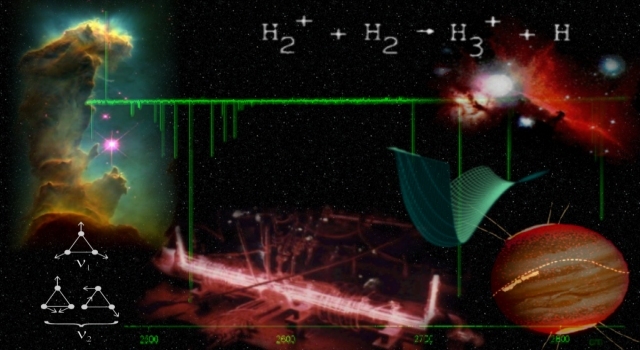 Collage by C. M. Lindsay; H3+ laboratory spectrum from A. R. W. McKellar; Jupiter H3+ emission image from J. E. P. Connerney. This Discussion Meeting is the third in a series of meetings intended to assemble researchers from different fields in which H3+ plays a major role and to discuss the most fundamental molecular ion from a variety of perspectives. Talks from the 2000 and 2006 meetings have been published in Phil. Trans. R. Soc. Lond. A 358, 2359-2559 (2000) and 364, 2845-3151 (2006). Related hydrogenic species: H5+, H3, H3-, etc. The talks and discussions will be published in the Philosophical Transactions of the Royal Society.